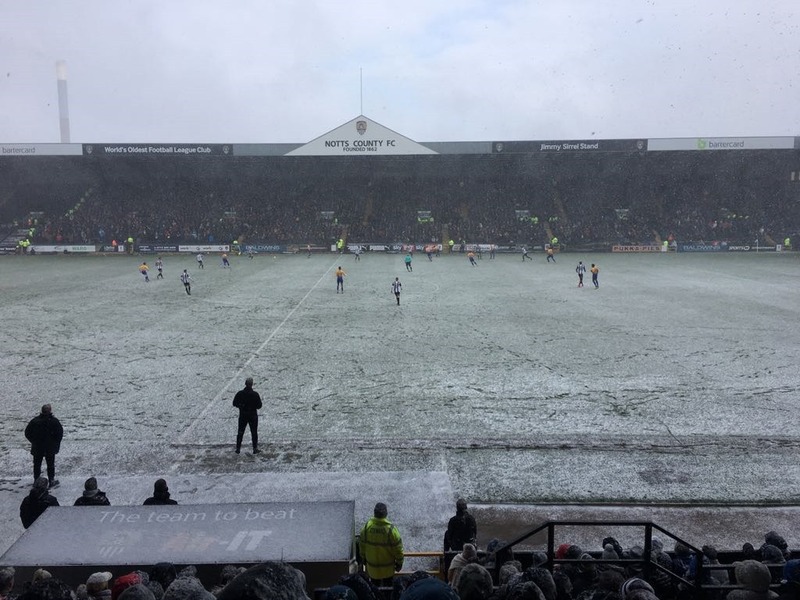 SATURDAY 17TH MARCH, ST PATRICK’S DAY and a lunchtime visit to Meadow Lane Stadium to take in a local Nottinghamshire derby game between Notts County and their counterparts some fifteen miles north, Mansfield Town. Most definitely a ‘six-pointer’ with the Stags lying just two places behind Notts in third place in League Two. A less familiar 1pm kick-off meaning a direct journey via bus and bus to the Meadows, just short of Trent Bridge and taking my seat with a friend only just in time two minutes before play proceeded. 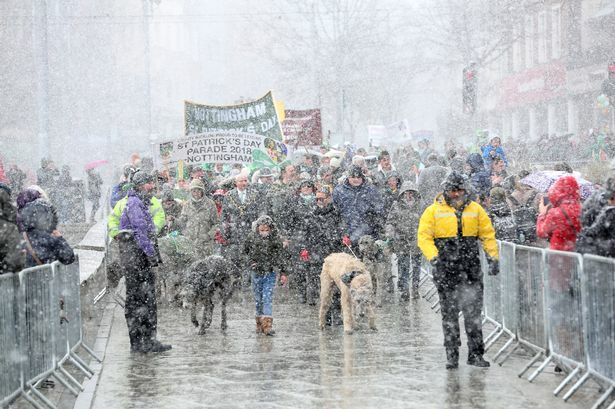 A strange kaleidoscope of weather on the way there through short, sharp blizzards of fine dry snow which failed to settle at this stage but made it almost impossible to see properly as I strode across Old Market Square with muted St Patrick’s Day celebrations ensuing. I felt a little sorry for the damp squib that this year’s revelling appeared to be. The previous day and with some slightly alarming warnings of poor weather conditions, the organisers had decided to abandon the usual exuberant celebrations with an outdoor stage in Slab Square when representatives from an Irish County are invited to lead the event and receive hospitalities with a background of traditional music and dance. What a great shame and I hope the Irish diaspora of the locality can once again enjoy festivities as usual gain next year. I’m pretty sure they made the best of things though. The game itself set off at furious pace is is the way of these games with a length of the pitch falling in the shade of the Derek Pavis Stand white over with thin powdery snow. Today was not to be a day for silky football skills but rather a war of attrition waged in sub-zero, quite appalling conditions at times. 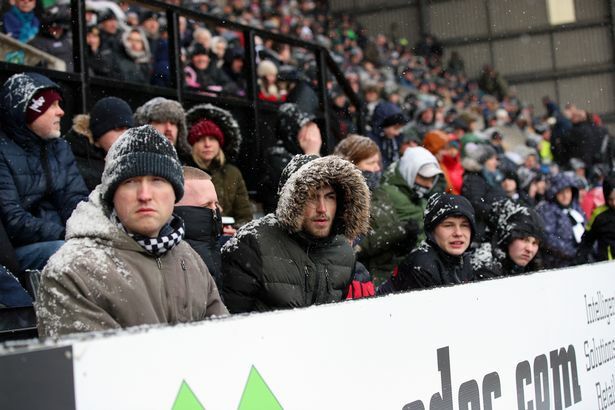 At regular intervals the blizzards re-emerged making it quite difficult to watch the game effectively as snow came breezing through under the high roof of the stand resting on the few thousand people within it. A quite bizarre scene at times and one I scarcely recall witnessing in thousands of games over many years in different stadiums. With just a short journey for Mansfield’s following, a good 4,500 or so of their supporters inhabited the Jimmy Sirrel Stand and made their presence felt from prior to the whistle. A 12,500 attendance rated as a healthy one for a League Two game in such unpleasant conditions. With prevailing weather conditions prohibiting more expansive play it was probably not surprising that the first goal was a somewhat scrappy one, Notts’ experienced veteran, Shola Ameobi rattling the crossbar with a header and the ball falling to the Magpies’ Hawkridge’s feet to bundle into the net.Play being fairly even, it was a significant marker for Notts in getting their noses in front. Notts other experienced striker, John Stead played an influential part in the game in his promptings from up front, attempting to bring his teammates into the play. There were a few angry skirmishes as one might expect from such a tightly fought fixture with much at stake. Notts midfielder, Noble impressed at intervals with his commanding play while Mansfield’s Conrad Logan enjoyed a solid performance, the former Hibs hero solid in the Stags’ goal. The game appeared to be blustering towards a merciful finish and a victory to the home side before referee Woolmer signalled for seven minutes of stoppage time. After a full 98 minutes, Alessandra of Notts handled just inside the area to concede a penalty to Mansfield which Kane Kemmings emphatically dispatched into the Notts County net. With little time left, honours ended even at 1-1. I noticed that post-match, Magpies young Manager, Kevin Nolan was unhappy about the decision and the amount of time being added on, not for the first time recently him complaining about officials in his frustration. I hope he manages to address this as in this case, for me, it was nothing more nor less than a stonewall penalty as playbacks showed. So thankfully, I filed out of Meadow Lane and towards the Meadows and the city centre beyond. One late piece of drama was on the bus itself with some confusion reigning and passengers trooping off the bus from the upper deck. We were finally told that a man was unwell upstairs and that emergency services had been summoned. I walked off to catch the appropriately named ‘Jimmy Sirrel and Jack Wheeler’ tram further towards the city whilst I read in retrospect that the unfortunate ‘casualty’ had to be ‘extracted’ from the upper deck by the fire services. I hope he’s alright, whoever he is. The tram drew through a fairly dismal looking Old Market Square, the Irish boys and girls no doubt ensconced in Nottingham’s comfortable bars, and towards home and a warming hot drink and a welcome place by the fireside. I don’t really keep up with English football otherwise I’d have popped up the road to watch the Mansfield Town v Middlesbrough cup tie first-hand this afternoon. Although Forest, and to an extent Notts have always been bigger fish than The Stags around here and are also half the distance away, Field Mill is only around ten minutes drive from the Kingdom of Redhill and therein Chez Frew. Just tuning in live on the BBC and I have to say that I’m fairly impressed with plucky little Mansfield. After a shaky start when they resembled a pub team/Hearts they came on to a bit of a game and were a bit unlucky to be one down at the interval. During the second half they continue to give the Premiership side a tough time, with Mansfield forward, Balding’s pace showing up well and causing problems for the Teesiders.